I am a very big fan of ginger in any form - simple ginger cakes, ginger upside-down cakes with pears or plums or apples, ginger ice cream, ginger custard or ginger cookies. And whether it's powdered ginger, crystallized ginger, freshly grated ginger or a halting combination of all three, I love the spicy explosion it introduces to pastries and desserts. As we approach the holidays, it's time to get our cookie act together. And since it's the fall season, spices are never far from our reach, along with chocolate. So this cookie is a celebration of all these things. 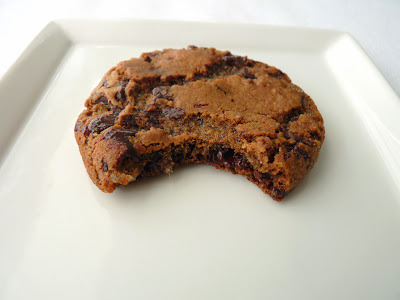 It's a chewy cookie with crispy edges and each bite brings a different sensation. It's either a pop of crystallized ginger, a gooey hit of dark bittersweet chocolate or a punch of salt. I find it very satisfying, especially if you hit all three. - I like bittersweet chocolate in these cookies. 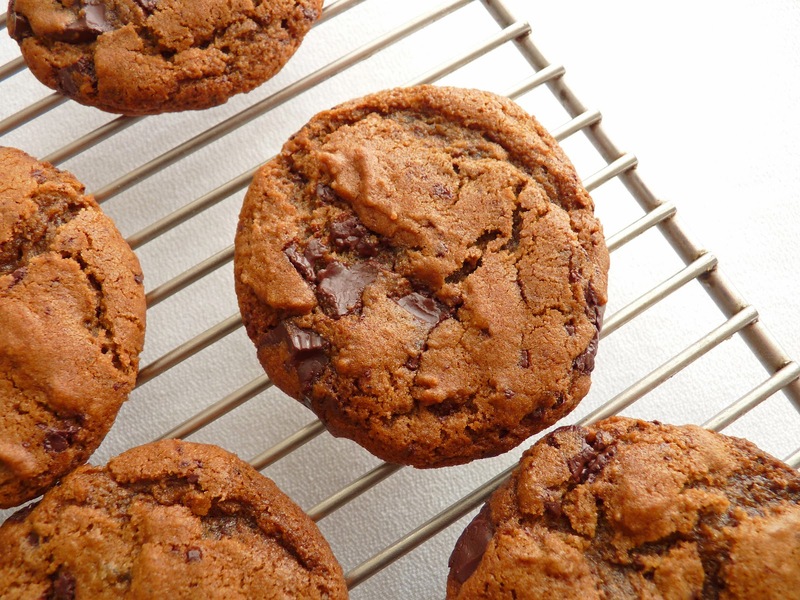 If you prefer a sweeter cookie, use semisweet. - You can find less expensive crystallized ginger at bulk groceries or Trader Joe's. 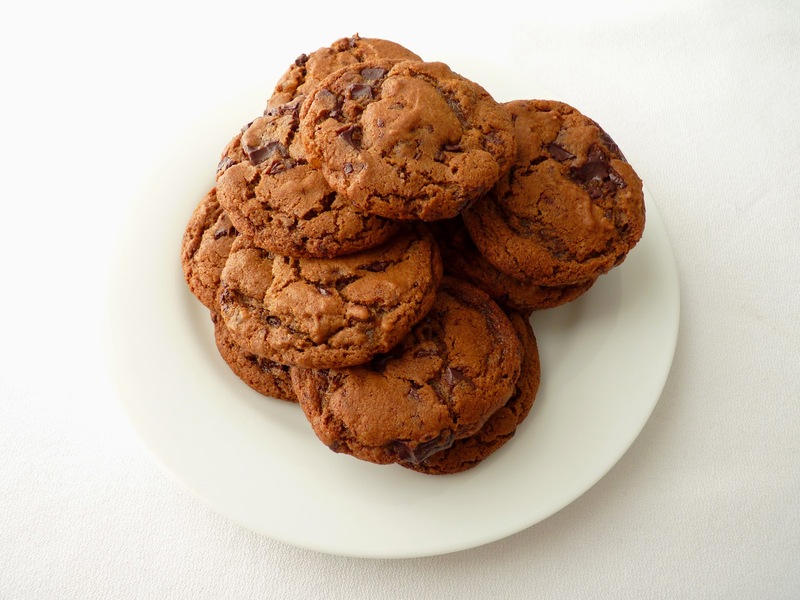 - If you have the time, scoop the cookies, place them all together on a smaller 1/4 baking sheet, wrap with plastic and place in the refrigerator to firm them up before baking. 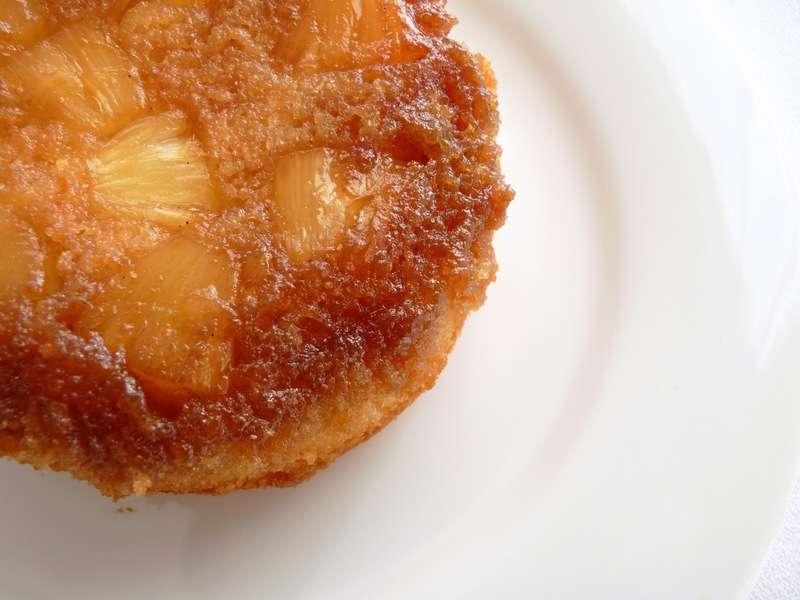 - If you're a ginger fan, check out Plum Ginger Upside-Down Cake, Gingerbread Shortcake with Pears and Ginger Ice Cream. Sift the flour, cocoa, baking soda, spices, salt and pepper. Combine the melted butter, sugars, molasses and egg until thoroughly blended. Stir in the flour mixture. Add the chopped ginger and chocolate. Scoop the cookie dough into 1 tablespoon portions and form into balls. 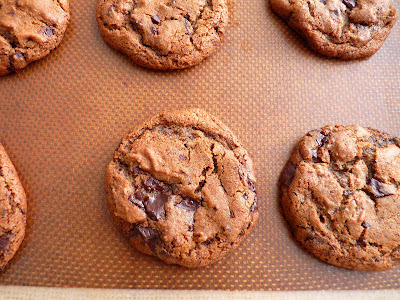 Place 12 on each baking sheet. Bake for 10 - 12 minutes. Cool on a wire rack before removing from pan. Store in an airtight container. 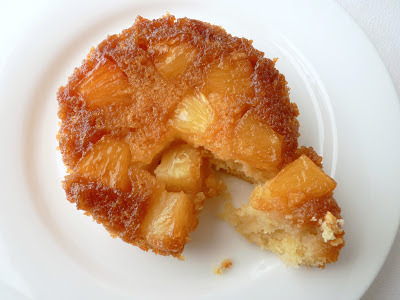 Today I'm re-visiting Pineapple Upside Down Cake, that old stand-by and household favorite originating in the 20s and popularized in the 50s. It appeared on many a dessert and pot-luck table all across America for decades. It was an easy cake baked in a skillet that, once inverted, impressed everyone with its glistening sweet pineapple and bright red cherries. This isn't your mom's Pineapple Upside Down Cake. I thought I'd do something a little different and fun with it so I used fresh pineapple, skipped the cherries, added some booze and made individual servings. The cake is very tender and moist with a touch of rum to liven up the party. The topping is the usual brown sugar and butter blend but with a splash of rum, a 1/2 vanilla bean and a pinch of salt. The tart acidic fruit is bathed in the traditional caramel flavor just as before but with a bit of depth and a little contrast added. The aroma is big and inviting. Next time you'd like a little flashback to another era but with a modern twist, have a slice of this rum version. It's an especially good treat to warm your spirits on a chilly night. - You'll need a medium-sized fresh pineapple or about 20 oz if you prefer to use canned. - I use a large ice cream scoop to portion the batter. - The recipe could just as easily be made into one 9" cake to serve 8 people. Bake for about 45 - 50 minutes or until a tester comes out clean. 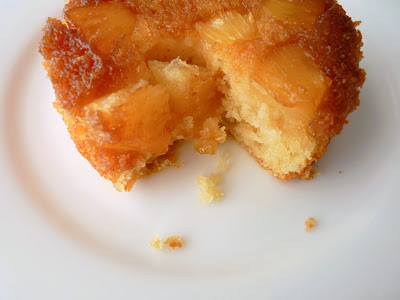 - This cake would also be great topped with fresh pear or apples. Preheat oven to 350 degrees. Lightly grease the sides of six 4 1/2" diameter ramekins. To make the topping, place 2 oz of butter in a saucepan. Split and scrape the seeds from vanilla bean and add to the butter along with the casing. Melt the butter over low heat. Add brown sugar and cook, whisking to combine, for about 2 - 3 minutes. Whisk in rum and a pinch of salt and remove from heat. Distribute evenly to each of the ramekins. Arrange chopped pineapple on top of the sugar mixture. Place the ramekins on a baking sheet and set aside. Sift the flour, baking powder and salt. Combine rum and vanilla with the milk. Beat the butter and granulated sugar until light and fluffy. Add eggs one at a time, beating well and scraping down the bowl after each addition. Add a third of the flour mixture alternately with half the milk, beginning and ending with the flour. Mix just until blended, scraping down the bowl and incorporating everything together. Portion batter over pineapple and brown sugar topping and spread to the edges. Bake until golden and a test comes out clean, about 30 minutes. Place on a wire rack and cool for 10 minutes. Invert the cakes onto serving dishes and cool. Serve warm or at room temperature. I have some fun news to share and it's about Madeleines, those little French teacakes that everyone seems to find irresistible. 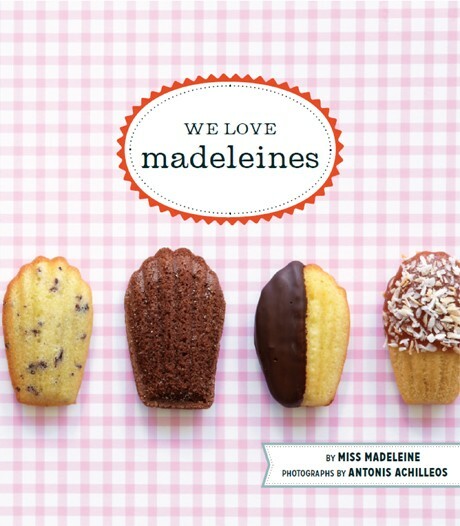 Chronicle Books has a new cookbook release on October 17th entitled, We Love Madeleines. 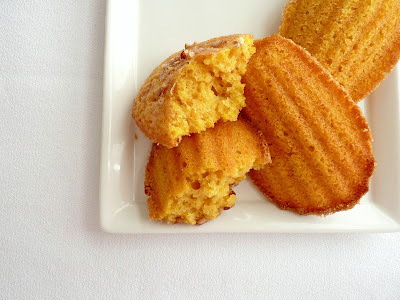 It's a compilation of all kinds of Madeleine recipes and I'm delighted to say they've included my Chocolate Olive Oil Madeleines in the collection. I love this recipe with its great mix of chocolate, extra virgin olive oil and salt, so I was very pleased when I was contacted about using it in the book. We Love Madeleines is Chronicle's first crowd-sourced cookbook. There are 40 recipes that range from Molasses Spice, Apple Buckwheat with Sea Salt Caramel and a savory Rosemary Parmesan Polenta. It also features gluten-free and vegan options and a chapter on glazes, dips and toppings. I'll be trying out some of these in the not-too-distant future. 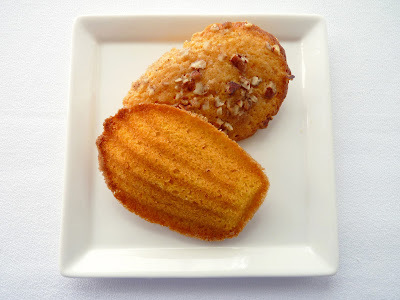 In the spirit of this new book as well as the arrival of pumpkin season, I thought I'd put together some Pumpkin Pecan Madeleines. 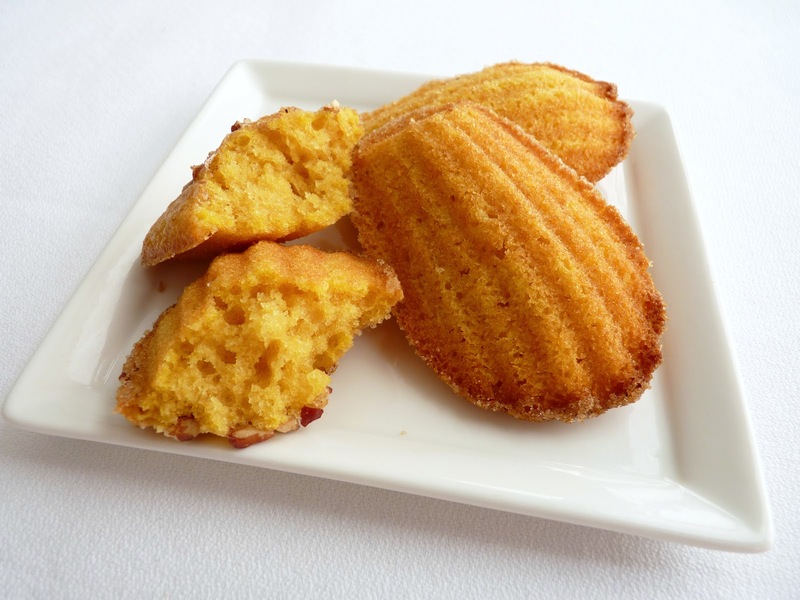 Madeleines are usually made in the genoise tradition, which means the eggs and sugar are whisked to a ribbon stage. I didn't stray too far from my basic formulation, so they are light, moist and subtle in flavor. For this recipe, once the mixture has reached full volume, I add vanilla and 1/4 cup pumpkin and then garnish with a good dose of spiced sugar and finely chopped pecans. The result is a moist little teacake with edges that are crispy and chewy and an interior that is spongy and soft. While I also appreciate all the pumpkin loaves and cakes of the season, this is a nice alternative you can bake when you have extra pumpkin puree on your hands. Bon Appetit! - The recipe instructions are for a stand mixer. If you're using a hand mixer, it will take a bit longer to get the eggs and sugar to the ribbon stage. To test, lift the beaters about 6" and let the ribbons of batter fall to the surface. If they hold for a second, it's ready. - If you have an orange on hand, you might consider adding a smidgeon of zest. - I use a small #40 ice cream scoop that is perfect for forming cookie doughs to portion the batter. The wells should be nearly full. - Madeleines are best eaten the same day. Preheat oven to 375 degrees. Generously butter a Madeleine pan. Lightly dust with flour and knock out the excess. Sift the flour, baking powder, salt and spices. Melt the butter and set aside to cool. Beat eggs and both sugars until thickened and batter falls in ribbons when whisk is lifted, about 5 minutes. Add vanilla and pumpkin and blend. Take off the mixer and fold in the flour by hand in 3 additions. Fold in one-third of the butter until combined. Fold in another third and then fold in the remainder and mix thoroughly. Combine 2 tablespoons sugar, 1/4 teaspoon cinnamon and a pinch of allspice and clove. Portion the batter in the madeleine pan. Dust generously with spiced sugar and garnish with pecans. Bake until the cakes spring back when touched and the edges are darkened, about 11 - 13 minutes. Let them cool for 1 minute and then use a small spatula or knife to dislodge them. Cool completely on a wire rack. Repeat with remaining batter. A few weeks ago I wrote about some Spicy Caramel Pears from David Lebovitz that I paired with chocolate cake. The pears are baked in an intoxicating sauce of butter and brown sugar along with a warm complement of cognac or brandy. There's also a healthy dose of cinnamon, cloves, star anise and pepper for lots of depth and complexity. Once they're baked to a soft and juicy texture, the sauce is finished with a splash of cream to give it a touch of luxury. It's a great aromatic pear dessert made even better when served with a scoop of vanilla ice cream. I always find the transition between seasons to be sort of slow pokey. It takes me a while to shift from one set of seasonal pastry and dessert ideas and ingredients to the next. But with each successive visit to the markets I start to shift gears. 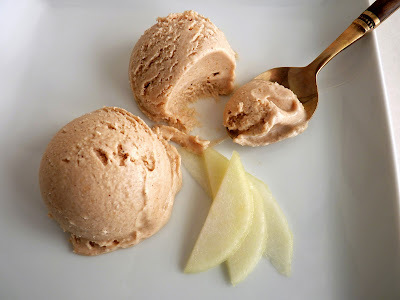 And since pears are the fruit of the moment and I happen to really love pears, I decided to re-visit David's easy and delicious recipe and turn the baked pears into this spicy caramel pear ice cream. And it was ridiculously easy to do! 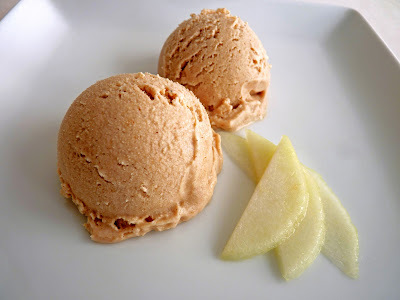 I simply took the baked pears and the sauce and pureed them in my trusty food processor. Then I added more cream, a balance of milk, some lemon juice and a good pinch of salt. The result of this little excursion is some really good ice cream and a house that smells incredible with the warm spices of the season. It's another good way to enjoy David's inspired pear dessert and definitely make the shift to fall. - Pears should be ripe but firm so they'll be tender and juicy for perfect flavor and texture. - Depending on the size of your pears and the amount of the resulting puree, add the cream and milk, lemon juice and salt to your own taste. - You can certainly make this all in one day but I did it in three stages. I first baked the pears and let them sit overnight with the sauce to encourage the spices to flourish. 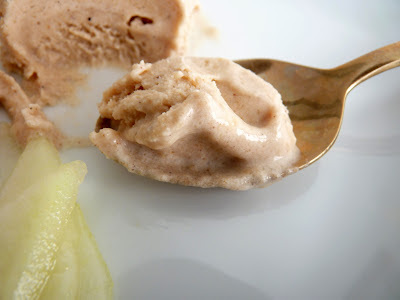 The next day, I pureed the pears with the sauce and added the remaining ingredients. I let that chill overnight. The next day I churned the ice cream. Preheat oven to 400 degrees. Choose a baking dish large enough to hold the sliced pears in a single layer. Cut the butter into small pieces and place it in the baking dish with the brown sugar. Set the dish in the oven for a few minutes until the butter is melted. Crush the whole spices by placing them in a plastic bag and pounding with a rolling pin. Peel and core the pears and cut them into quarters. Remove the dish from the oven and add the crushed spices and liquor. Stir to combine all the ingredients. Add the pears and toss everything together to coat the fruit. Arrange pears in a single layer. Cover the dish with foil and bake for 30 - 45 minutes, depending on the size and firmness of your pears. The pears should be easily pierced with a knife but not mushy. Stir and baste them a couple of times during baking so they're evenly coated with the sauce. Remove the pears from the oven and lift them out of the cooking liquid and onto a plate to cool. Scrape all the juices and spices from the baking dish into a saute pan. Add 1/4 cup cream and cook over medium heat until the mixture turns a deep color, thickens and caramelizes. Strain the finished sauce into the bowl of a food processor and let it cool. Add the pears to the food processor and process with the sauce until you have a smooth puree. Pour into a bowl and whisk in the cream and milk to taste, depending on how much puree you have and how you want to balance the richness. Then add lemon juice and salt to taste. Start with the lower end of suggested amounts and keep adding and adjusting these last ingredients until you have the right strength of flavor and a balance of sweet, fat (mouthfeel determined by the ratio of cream and milk) and brightness (lemon juice and salt). Pour into an airtight container and refrigerate until thoroughly chilled. Freeze according to your ice cream machine's instructions. Pour into a clean airtight container, press a piece of plastic wrap into the surface, cover and place in your freezer to firm up.